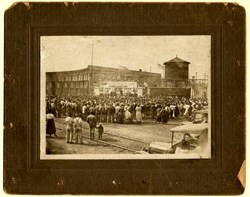 Original photograph of Fourth Liberty Loan Rally outside of an industrial facility. Dated on back September 28, 1918. Apr 24, 1917 Emergency Loan Act authorizes issue of $5 billion in bonds at 3.5 percent. Oct 1, 1917 Second Liberty Loan offers $3 billion in bonds at 4 percent. 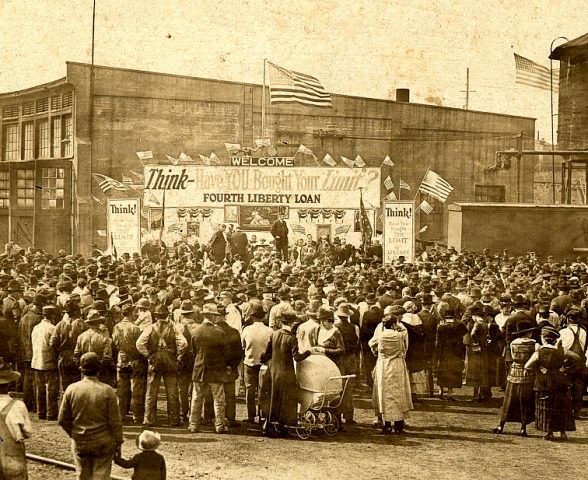 Apr 5, 1918 Third Liberty Loan offers $3 billion in bonds at 4.5 percent. Sep 28, 1918 Fourth Liberty Loan offers $6 billion in bonds at 4.25 percent. Interest on up to $30,000 in the bonds was tax exempt. First Liberty Bond Act The 1st Liberty Loan Act established a $5 billion aggregate limit on the amount of government bonds issued at 30 years at 3.2% interest, redeemable after 15 years. It raised $2 Billion with 4 million people purchasing bonds.